The first thing I did when we moved into our home was paint a wall in my kitchen with chalkboard paint. 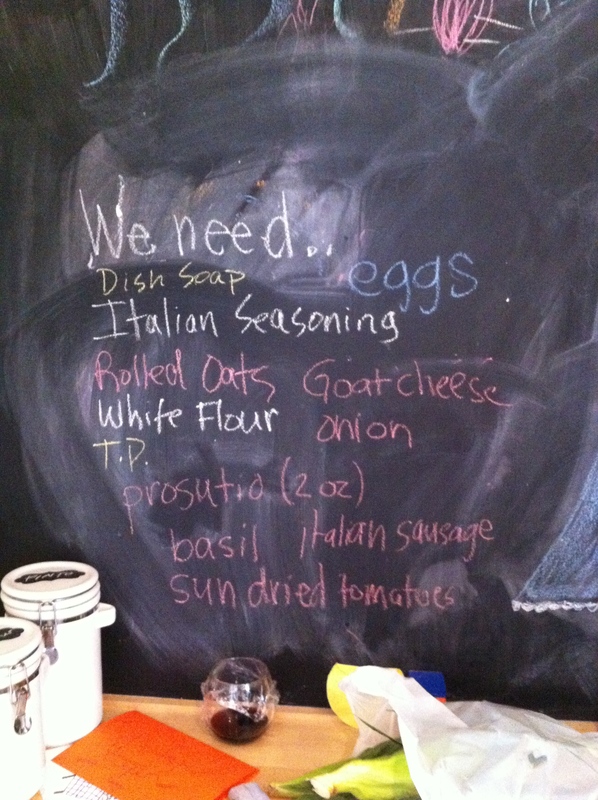 The chalkboard is the center of communication in our home. Birthdays, holidays and gratitude are expressed in colored chalk. 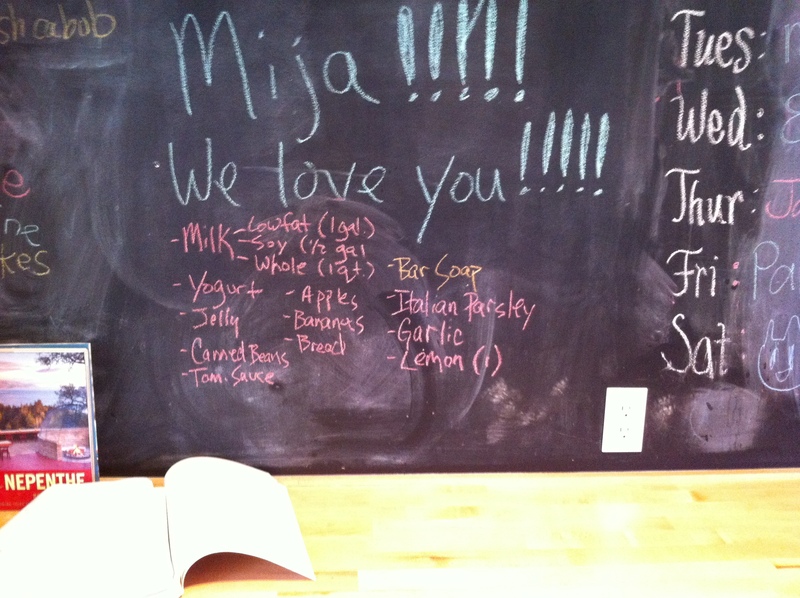 The board keeps us accountable like the tally marks signifying the dollars I owe my kids for filling their marble jars. Or the dishwashing schedule so no one can squeal, “it’s not my turn to wash dishes.” But the primary purpose of the chalkboard is to organize meals. Anywhere between 30-50 percent of all food is wasted in the United States. We grow food, cook food, package food then throw half of it away. All wasted food can be expressed in virtual gallons of water. Food waste occurs at every step of the food chain, but we each have the power to minimize waste by simply planning our meals. 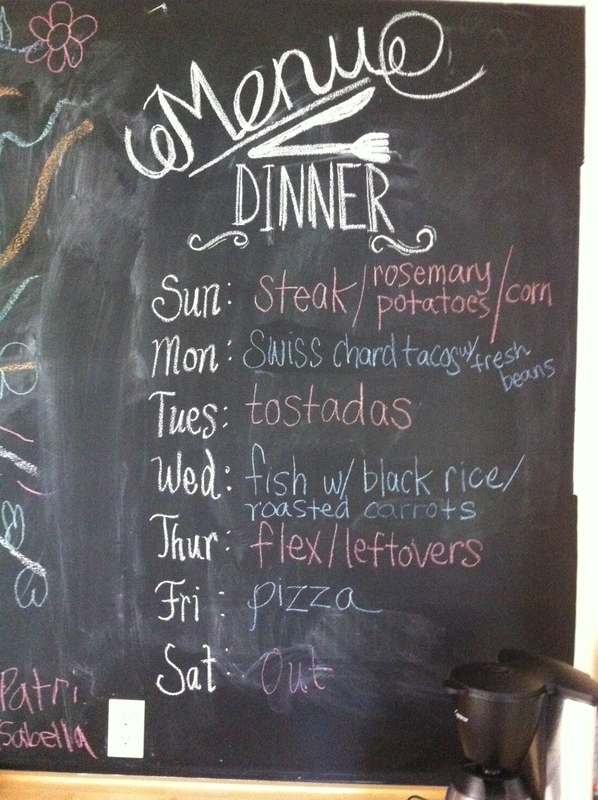 Sundays is the day we plan the meals for the week. I add any needed ingredients for the dinner menu to the list under the heading “We need… .” The list grows incrementally throughout the week with the final additions after I’ve written our menu. After the list is complete, I take a picture of it with my smart phone. The photo becomes a paperless list I take to the farmer’s market and grocery store. Want more ideas to cutdown on food waste in your home, AND save water at the same time. Check out Food Waste and Water for a list of seven ideas to lower your weekly food waste. Eat less water at the kitchen table. There is power in the collective. This idea isn’t only clever and saves water, it serves to have the family involved too. Love it! Thank you Mona. Saving water is a family affair! Wonderful idea – I love your chalkboard and your beautiful kitchen! I am obsessed with chalkboard paint. I recently painted the surface top of my dining room table. At parties I write the name of the food with arrows pointing to each dish. I like to think it cuts down on food waste too.